Los Angeles, CA. There are times when I'm desiring home-cooked Latin American flavor offered up with warmth and modesty. Brainstorming among friends, I've wondered if such a place existed anymore; among the LA food 'scene' and latest restaurant 'trend' I worry for those that get lost in the shuffle. There are places I frequent and forget to mention because I've viewed them as an extension of my kitchen and my upbringing. Yet every time I introduce someone to the Salvadorian rooted Con Sabor Restaurant y Pupuseria, I'm able to share in this hidden treasure that warms their tummy and brings a smile to their face. This isn't my home, this isn't my family, and I know no one here, I've merely stumbled upon a restaurant that invokes a sensation where an introduction is long overdue. A friend and I first walked into the restaurant with hesitation, wandering to the front, searching for a host stand or something resembling what we've grown accustomed to in many restaurants. It was located at the rear, just off the kitchen, where out peered an older woman with netted hair who spoke but a few words of English. She smiled ear-to-ear as she escorted us to a nearby table and my friend and I took our seats. While absorbing the menu and full page of pupusa offerings, a young woman approached the table, unsure to speak Spanish or English, using both to be safe. I've familiarized myself enough with the eatery now that I merely skim as a formality before ordering my usuals. Breakfast is served all day, tamales are available when they're available, and I've yet to be disappointed with their signature dishes broken down by meats. Huevos Con Chorizo, Huevos Con Jamon - are my standard orders, despite having a menu that covers so many great options. I've eaten their pancakes, Pechuga de Pollo and sampled their Carne Asada, but breakfast for dinner with tortillas? That's how we did it in my family. A scramble, some crema, plantains, and their Casamiento has become an adult alternative to my childhood breakfast-for-dinner staple. 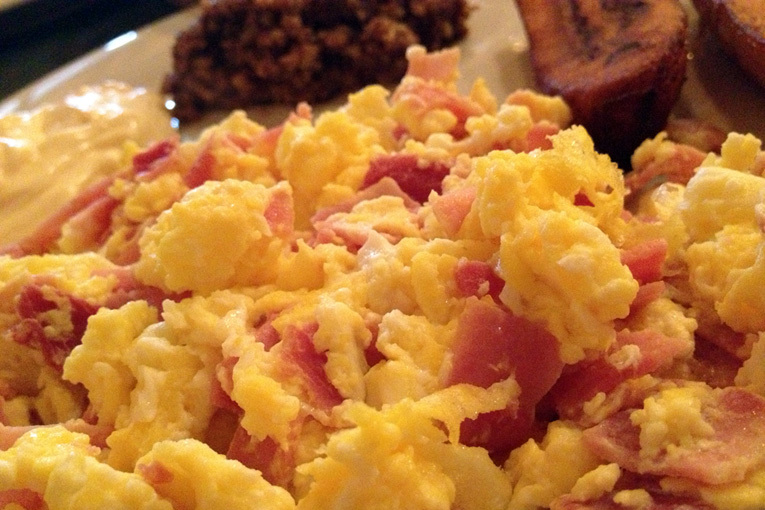 It's a dry scramble, well-integrated, and well-cooked. Anytime there's a veggie, it comes out semi-cooked with a crunch. The crema is an ideal pairing, slightly thicker, salty, and buttery as compared to standard sour cream (available at some grocery stores). The Casamiento is a minced blend of rice and black beans. The texture is inconsistent with either, but tastes like both, and is so new for those unsuspecting taste buds. It's a side I order separately if I run out too early in my meal. 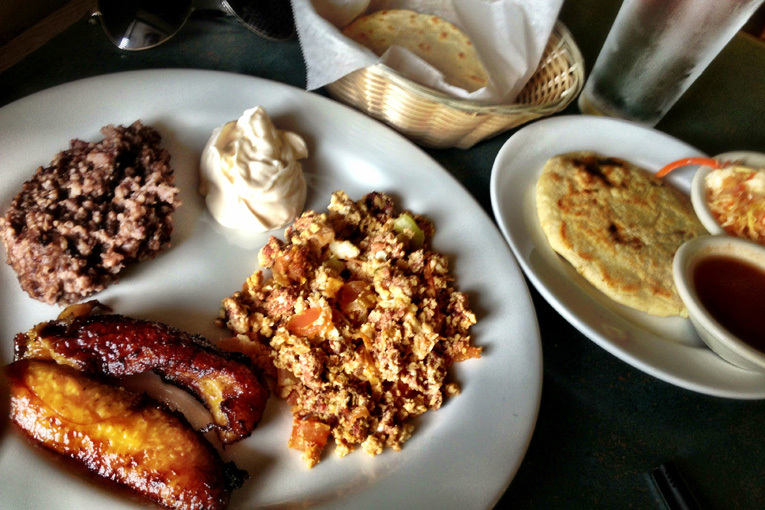 The tortillas are an unstuffed version of their pupusa, hearty, and round out the eat. Tamales Con Pollo - meet the expectation of the traditionally steamed dish (also offered up fried) with a heavy handed helping of pulled chicken in the center. I've grown accustomed to purveyors of these specialty eats having outages if the supplier goes on vacation. Unfortunately, the scale of the restaurant is small enough to where their in-house supply can also go quickly due to its demand. The taste is great, and the steamed concoction is worth a try when it's around. 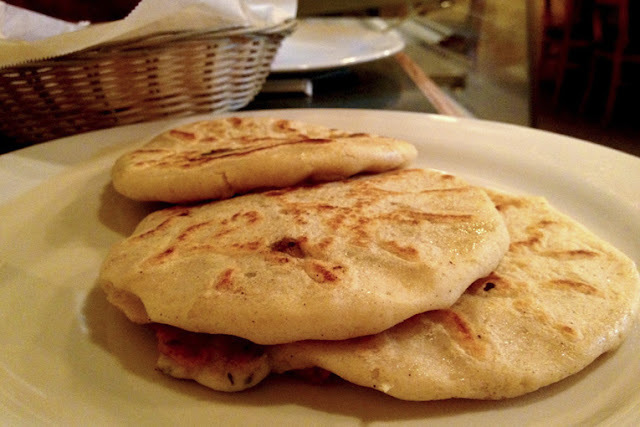 Pupusas - is a corn flour-water blend stuffed with cheese and the chosen specialty flavor, if not simply cheese and more cheese. Hand-pressed, padded, and stove-top cooked, the pupusas are made to order. Piping hot, cheesy, and gooey - the pupusas are flavorful as flavorful can wonderfully be, so naturally it's hard to eat just one. They're heavy, perfect for splitting, but individually two or three can be plenty as a meal. I've tried a number of the stuffings (salchicha, loroco, jamon y queso, revueltas, ajo, chorizo, chicharron, etc.) and never leave with a bite still on my plate. 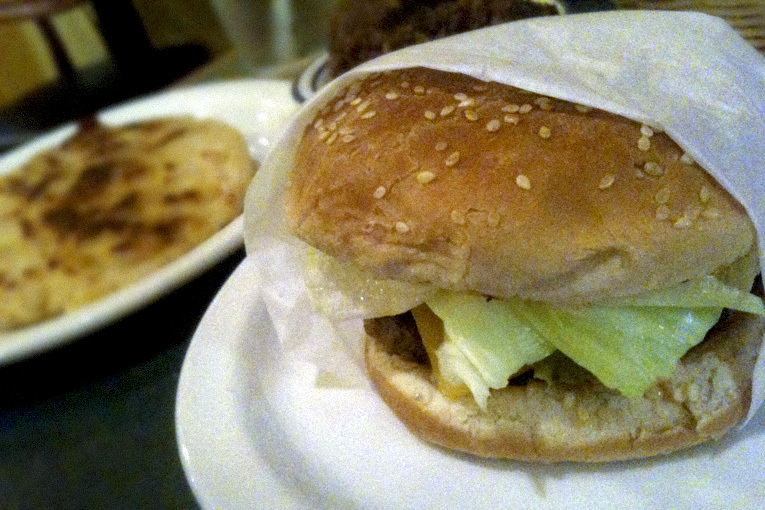 Cheeseburger - there is a very small menu in the back with burgers and fries, which I've seen in a number of Latin American and Asian restaurants. Though a 'safe' choice if hesitant with the menu itself, the burger is a plain ole burger that brings up some awkward feelings of high school - but wait, do I want that? It's 'fine' but with so much more to eat, it serves better as a meal addition, not a replacement. I go and I go, but I forget to mention, recommend, or write up anything about this place. If you're someone, like me, who grew up with Latin American food specific to Central American culture and cuisine, this is a worthy mention. Make the formal introduction and get acquainted. If you're local, like many of the goers already, you may find yourself a frequenter of the venue. It's quaint, it's cute, it's sweet, it's humble and for anyone from a small town, it brings the nostalgic memories of home in an endearing and welcoming way. Leaving with a full belly and a low bill, never hurts either!